Looking to express your gratitude for your invaluable assistant this Administrative Professionals’ Day? 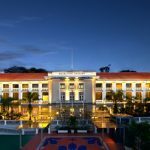 The Salon at Hotel Fort Canning is celebrating the exemplary contributions of the administrative support professionals among us from 25 to 30 April 2018 with enticing 3- and 4-course epicurean delights. With a menu thoughtfully crafted by Executive Chef Tan, diners can look forward to beginning your appreciation lunch or dinner with Chilled Smoked Peking Duck, prepared sous vide to whet your appetite. Or opt for a taste of Japan with our Okinawan Sweet Potato Soup, freshly flown from the Land of the Rising Sun and slow cooked to perfection. For your main course, choose between the Asian-inspired Seared Barramundi, featuring shogoin turnip and mille feuille vegetables, or the Fusion Samgye-tang Confit, a delightful rendition of Korea’s heartwarming ginseng chicken dish. Neither lunch nor dinner is over until dessert is served, so be sure to complete your dining experience on a sweet note with our Matcha Crème Brûlée, a rich green tea egg custard complemented with a scoop of vanilla ice cream. The Administrative Professionals Week menu is available for lunch and dinner from 25 to 30 April 2018. The 3-course lunch and 4-course dinner sets are priced at $28++ and $38++ respectively. Surprise your administrative professional with the gift of a luxurious experience to be savoured in his or her own time with our selection of gift vouchers. In denominations of $25 and $50, our gift vouchers are welcome for use in our dining outlets, The Salon and Tisettanta Lounge, or for our luxurious accommodation. For purchase of gift vouchers, please contact us at 6559 6769 or reservations@hfcsingapore.com.